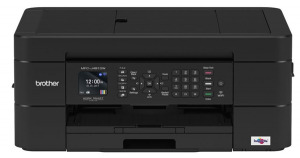 The Brother MFC-J5330DW Business Smart Plus All-in-One is a small business-durable machine with flexible paper handling. The 250-sheet paper tray holds up to 11”x17” paper and offers automatic duplex (2-sided) printing. The auto document feeder adds the convenience of unattended scan and copy with a 50-sheet capacity. For added versatility, the single-sheet bypass tray allows printing on specialty paper such as card stock and envelopes.